Adapter. Used to insert a smaller storage device into a larger slot in a computer or other device. Additive primary color system. The red, green, and blue hues used alone or in combinations to create all other colors you capture with a digital camera or scanner, view on a computer monitor, or work with in an image editing program like Photoshop, Photoshop Elements, or Paint Shop Pro. See also subtractive primary colors, CMY(K) color model. Airbrush. The airbrush is an image editing feature that simulates an artist's tool that sprays a fine mist of paint. It is used for both illustration and retouching. Aliasing. The jaggy edges that appear in bitmap images with curves or lines at any angle other than multiples of 90 degrees. Ambient lighting. Soft, nondirectional lighting that bounces off walls, ceilings, and other objects in the scene, rather than appearing to come from a single light source. Anti-aliasing. A process that smoothes the rough edges or jaggies in images by creating partially transparent pixels along the boundaries that are merged into a smoother line by our eyes. See also jaggies. Angle of view. The amount of a scene that can be recorded by a particular lens; determined by the focal length of the lens. Aperture (of lens). Size of the lens opening through which light passes. The relative aperture is calibrated in f-numbers, being the diameter of the beam of light allowed to pass through the lens, divided into its focal length.Widest relative apertures therefore have the lowest f-numbers. All lenses set to the same f-number give images of a (distant) scene at equal brightness. Aperture preview. Button on some SLR cameras to close the lens to the aperture set for photography. Allows you to visually check depth of field in the viewfinder. Aperture-priority. A camera setting that allows you to specify which lens opening or f-stop you want, with the camera selecting the required shutter speed automatically, based on its autoexposure system. See also shutter-preferred. Aperture value (Av). AE camera metering mode by which you choose aperture, and the metering system sets shutter speed (also called aperture priority). APS Advanced Photographic System. Easy-load cameras and film cartridges 30 per cent smaller than 35 mm. Artifact. A type of noise in an image, or an unintentional image component produced in error by a digital camera or scanner during processing. For example, a 'hot' or 'dead' pixel in a digital camera sensor can show up as a white or black dot in your photos. ASA Stands for (obsolete) American Standards Association. The initials were once used for a film speed rating system. Now replaced by ISO. Aspect ratio. This is usually found in dialog boxes concerned with changes of image size and refers to the relationship between width and height of a picture. The maintaining of an image's aspect ratio means that this relationship will remain the same even when the image is enlarged or reduced. Automatic flash. An electronic flash unit with a light-sensitive cell that determines the length of the flash for proper exposure by measuring the light reflected back from the subject. Auto-focus (AF). A camera setting that allows the camera to choose the correct focus distance for you, usually based on the contrast of an image (the image will be at maximum contrast when in sharp focus) or set by a mechanism, such as an infrared sensor, that measures the actual distance to the subject. Cameras can be set for single autofocus (the lens is not focused until the shutter release is partially depressed) or continuous autofocus (the lens refocuses constantly as you frame and reframe the image). Auto-Focus lock (AF-L). Locks an auto-focus lens at its present focus distance. Automatic exposure (AE). A mode of camera operation in which the camera automatically adjusts the aperture, shutter speed, or both for proper exposure. Auto-Exposure lock (AE-L). Locks an automatic exposure setting in the camera's memory. Averaging metering. A light-measuring system that calculates exposure based on the overall brightness of the entire image area. Averaging tends to produce the best exposure when a scene is evenly lit or contains equal amounts of bright and dark areas that contain detail. Today, most digital cameras use much more sophisticated exposure measuring systems based on center-weighting, spot-reading, or calculating exposure from a matrix of many different picture areas. Backlighting. A lighting effect produced when the main light source is located behind the subject. Backlighting can be used to create a silhouette effect. Backlighting is also a technology for illuminating an LCD display from the rear, making it easier to view under high ambient lighting conditions. See also ambient lighting, fill lighting, and front-lighting. Background printing. A printing method that allows the user to continue working whilst an image or document is being printed from a computer. Batch processing. Refers to a function or a series of commands being applied to several digital files at one time. This function is useful for making the same changes to a folder full of images. In Photoshop Elements, this function is found under the File menu and is useful for converting groups of image files from one format to another. Bayer pattern. A pattern of red, green, and blue filters on the image sensor's photosites. There are twice as many green filters as the other colors because the human eye is more sensitive to green and therefore green color accuracy is more important. Balance. A property of an image that has elements of equal weight, color, size, or other attribute on all sides. Back-lit. The subject is illuminated from behind and will be underexposed unless you use fill flash or exposure compensation. Bit. Stands for 'binary digit' and refers to the smallest part of information that makes up a digital file. It has a value of only 0 or 1. Eight of these bits make up one byte of data. Bitmap or 'raster'. The form in which digital photographs are stored, made up of a matrix of pixels. Bit-mapped. Images formed from pixels with each pixel a shade of gray or color. Using 24-bit color, each pixel can be set to any one of 16 million colors. Blend mode. The way in which a color or a layer interacts with others in a digital photograph. The most important after the Normal blend mode are probably Multiply (which darkens everything), Screen (which adds to the colors to make everything lighter), Lighten (which lightens only colors darker than itself) and Darken (which darkens only lighter colors than itself). Both the latter therefore flatten contrast. Color maintains the shading of a color but alters the color to itself. Glows therefore are achieved using Screen mode, and Shadows using Multiply. Black point. The tonal level of an image where blacks begin to provide important image information, usually measured by using a histogram. When correcting an image with a digital camera that has an on-screen histogram, or within an image editor, you'll usually want to set the histogram's black point at the place where these tones exist. Blur. In photography, to soften an image or part of an image by throwing it out of focus or by allowing it to become soft because of subject or camera motion. In image editing, to soften an area by reducing the contrast between pixels that form the edges. Bounce lighting. Light reflected from a surface, often ceiling or walls, to provide a soft, natural-looking light. Bracketing (exposure). Taking several pictures of your subject at different exposure times or aperture settings, e.g. half and double, as well as the estimated correct exposure. Brightness range. The range of brightnesses between shadow and highlight areas of an image. Bromide paper. Light-sensitive photographic paper for enlarging or contact printing. Carries a predominantly silver bromide emulsion. Must be handled in appropriate (usually amber or orange) safe lighting. Bracketing. Taking a series of photographs of the same subject at different settings to help ensure that one setting will be the correct one. Many digital cameras will automatically snap off a series of bracketed exposures for you. Other settings, such as color and white balance, can also be bracketed with some models. Brightness. The amount of light and dark shades in an image, usually represented as a percentage from 0 percent (black) to 100 percent (white). 'B' setting Brief or bulb. On this setting the camera shutter stays open for as long as the release button remains depressed. Burning-in tool. Used to darken a digital image, can be targeted to affect just the Shadows, Midtones or Highlights. Opposite to Dodge. Part of the toning trio, which also includes the Sponge. Buffer. A digital camera's internal memory, which stores an image immediately after it was taken until the image can be written to the camera's nonvolatile(semi-permanent) memory or a memory card. A buffer lets a camera capture a burst of images. Burn. A darkroom technique, simulated by most image editors, which involves exposing part of a print for a longer period, thus making it darker than it would be with a straight exposure. The term is also slang for creating a CD or DVD using writing software. Burning-in. Giving additional exposure time to one selected area, during printing to selectively darken. Burst mode. The ability of a camera to take one picture after another as long as you hold down the shutter release button. Byte. This is the standard unit of digital storage. One byte is made up of 8 bits and can have any value between 0 and 255; 1024 bytes equal 1 kilobyte; 1024 kilobytes equal 1 megabyte; 1024 megabytes equal 1 gigabyte. Camera RAW. A plug-in included with Photoshop and Photoshop Elements that can manipulate the unprocessed images captured by digital cameras. See also RAW. Camera shake. Movement of the camera, aggravated by slower shutter speeds, which produces a blurred image. 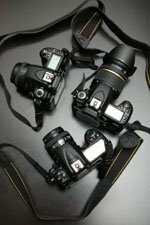 Some of the latest digital cameras have image stabilization features that correct for camera shake, and a few high-end interchangeable lenses have a similar vibration correction or reduction feature. Camera obscura. A dark chamber to which light is admitted through a small hole, producing an inverted image of the scene outside, opposite the hole. Card. The sealed package containing storage chips or other devices with electrical connectors that make contact when inserted into a card slot on a camera, printer, computer, or other device. Cassette. Light-tight container for 35 mm camera film. Cast. An undesirable tinge of color in an image. CCD Charge-Coupled Device. Electronic light-sensitive surface, digital replacement for film. CCD raw format. The uninterpolated data collected directly from the image sensor before processing. CD-ROM. Compact disc with read-only memory. Center-weighted metering. A light-measuring device that emphasizes the area in the middle of the frame when calculating the correct exposure for an image. See also averaging metering, matrix metering, and spot metering. Chromatic aberration. An image defect, often seen as green or purple fringing around the edges of an object, caused by a lens failing to focus all colors of a light source at the same point. Chrome. An informal photographic term used as a generic for any kind of color transparency, including Kodachrome, Ektachrome, or Fujichrome. CIE (Commission Internationale de l'Eclairage). An international organization of scientists who work with matters relating to color and lighting. The organization is also called the International Commission on Illumination. This organization's color model is based on human perception and is considered the most accurate. Clone Stamp or Rubber Stamp tool. Allows a user to copy a part of a digital image to somewhere else. It is therefore ideal for repair work, e.g. removing unwanted spots or blemishes. Equivalent to Copy and Paste in a brush. Close-ups. Photographs in which the picture area is filled with a relatively small part of the subject (e.g. a single head). Usually photographed from close to the subject, but may be shot from further away using a long focal length lens. Close-up attachments. Accessories which enable the camera to focus subjects that are closer than the nearest distance the lens normally allows. Close-up lens. A lens add-on, resembling a filter, that allows you to take pictures at a distance that is less than the closest-focusing distance of the prime lens alone. CMOS. Complementary Metal-Oxide Semiconductor. A type of solid-state sensor that captures the image; used in scanners and digital cameras. See also CCD. CMOS image sensor. An image sensor created using CMOS technology. CMY(K) color model. A way of defining all possible colors in percentages of cyan (C), magenta (M), yellow (Y), and frequently, black (K). Black is added to improve rendition of shadow detail. CMYK is commonly used for printing (both on press and with your inkjet or laser color printer). A few image editors, including Photoshop, can work with images using the CMYK model. Color balance. A color photograph that closely resembles the original subject appearance is said to have 'correct' color balance. Mismatching film type and lighting (wrong color temperature) gives a cast most apparent in gray tones and pale tints. Color correction. Changing the relative amounts of color in an image to produce a desired effect, typically a more accurate representation of those colors. Color correction can fix faulty color balance in the original image or compensate for the deficiencies of the inks used to reproduce the image. Color depth. The number of bits assigned to each pixel in the image and the number of colors that can be created from those bits. True Color uses 24 bits per pixel to render 16 million colors. Color filter array. A colored panel placed over the sensor, which keeps the sensors photosites (which are sensitive to all colors) from responding to light other than the color assigned to that pixel/photosite. Color mode. The way that a digital image represents the colors that it contains. Different color modes include Bitmap, RGB and Grayscale.
. A means of describing the color content of a 'white' light source. Based on the temperature (absolute scale, expressed in kelvin) to which a black metallic body would have to be heated to match the light, e.g. household lamp 2800 K, photoflood 3400 K.
CompactFlash. A storage media commonly used in digital cameras, music players, and other devices. Composite. In photography, an image composed of two or more parts of an image, taken either from a single photo or from multiple photos. Usually, composites are created so that the elements blend smoothly together. Composition. The arrangement of the main subject, other objects in a scene, and/or the foreground and background. Complementary colors. Opposite or 'negative' colors to the primary colors of light (blue, green and red). Each is made up from the full spectrum less the primary color, e.g. the complementary of red is blue. Composition. The activity of positioning the various subjects in a picture within a frame or viewfinder. Photographers often aim to create a visual balance of all the elements within their photographs. They do this via careful composition. Compression Refers to a process where digital files are made smaller to save on storage space or transmission time. Compression is available in two types: lossy, where parts of the original image are lost at the compression stage; and lossless, where the integrity of the file is maintained during the compression process. JPEG and GIF use lossy compression, whereas TIFF is a lossless format. Compression, lossy. A file compression scheme that reduces the size of a file but degrades it in the process so it can't be restored to its original quality. Contact printing. Printing with light, the object (typically a negative) being in direct contact with the light-sensitive material. Contrast (composition). Photographers who position subjects with different characteristics in the frame together are said to be creating contrast in the composition. Sitting a highly textured object against a smooth and even background creates a visual contrast between the two subjects and emphasizes the main characteristics of each. Contrast (exposure and tone). The difference (ratio) between the darkest and brightest parts. In a scene this depends on lighting and the reflecting properties of objects. In a photograph there is also the effect of exposure level, degree of development, printing paper, etc. Continuous autofocus. An automatic focusing setting in which the camera constantly refocuses the image as you frame the picture. This setting is often the best choice for moving subjects. See also single autofocus.Continuous tone: Images that contain tones from the darkest to the lightest, with a theoretically infinite range of variations in between. Contrasty. Having higher than optimal contrast. Crop. To trim an image or page by adjusting its boundaries. Cropping. Cutting out unwanted (edge) parts of a picture, typically at the printing or mounting stage.printer or monitor when compared with the original image. After you calibrate your scanner, monitor, and/or your image editor, the images you see on-screen more closely represent what you will get from your printer even though calibration is never perfect. Dedicated flash. An electronic flash unit designed to work with the automatic exposure features of a specific camera. Most such devices actually measure the light reaching the sensor as a way of determining proper exposure settings. Density. The ability of an object to stop or absorb light. The less light reflected or transmitted by an object, the higher its density. Depth of field. The distance between the nearest and farthest points that appear in acceptably sharp focus in a photograph. Depth of field varies with lens aperture, focal length, and camera to subject distance. Greatest with small lens apertures (high f-number), distant scenes and shortest focal length lenses. Depth of focus. The range that the image-capturing surface (such as a sensor or film) could be moved while maintaining acceptable focus. See also depth of field. Desaturate. To reduce the purity or vividness of a color, making a color appear to be washed out or diluted. Developer. Chemicals, normally in solution, able to convert the invisible (latent) image on exposed photographic material into visible form. Developing agents. Chemicals (typically phenidone, metol and hydroquinone) able to change light-struck silver halides into black metallic silver. Diaphragm. An adjustable component found in cameras, similar to the iris in the human eye, which expands and contracts to provide specific-sized lens openings, or f-stops. See also iris. Diffusing. Softening detail in an image. Diffuse lighting. Soft, low-contrast lighting, the visual result of which is gentle modelling of the subject with mild or non-existent shadows . Digital image. Stream of electronic data, forms visible image on computer monitor. Digital single-lens reflex (dSLR). A high-end digital camera that accepts interchangeable lenses; usually used by professionals or advanced amateur photographers. Digital zoom. A way of simulating actual or optical zoom by magnifying the pixels captured by the sensor. This technique generally produces results inferior to optical zoom. See also optical zoom. Digitize. This is the process by which analog images or signals are sampled and changed into digital form. DIN Stands for Deutche Industrie Norm (German Industrial Standard). DIN numbers denoted a film's relative sensitivity to light. Halving or doubling speed is shown by decrease or increase of the DIN number by three. Now incorporated in ISO and distinguished by degree symbol. Dither. A method of distributing pixels to extend the number of colors or tones that can be represented. For example, two pixels of different colors can be arranged in such a way that the eye visually merges them into a third color. Dodge tool. For lightening areas in a digital image. See also Burn. Dodging. A darkroom term for blocking part of an image as it is exposed, thus lightening its tones. Image editors can simulate this effect by lightening portions of an image using a brush-like tool. Has the opposite effect of burning-in. Dock. A device furnished with some digital cameras that links to your computer or printer, allowing you to interface the camera with the other devices simply by setting it in the dock's cradle. Docking. The ability to lock an image editing program's toolbars, palettes, and other features of the interface at fixed locations, usually one edge of the application window. Download. Sending a file from another device to your computer. DPI. Dots per inch, a term used to indicate the resolution of a scanner or printer. DX coding. Coding printed onto film cassette denoting speed, length, etc. Read by sensors in the film compartment of most 35 mm cameras. Dynamic range. The measure of the range of brightness levels that can be recorded by a digital sensor. Dye-sublimation (dye-sub). A printing technique in which inks are heated and transferred to a polyester substrate to form an image. Because the amount of color applied can be varied by the degree of heat (and up to 256 different hues for each color), dye sublimation devices can print as many as 16.8 million different colors. Electronic viewfinder (EVF). An LCD located inside a digital camera and used to provide a view of the subject based on the image generated by the camera's sensor. Emulsion. The light-sensitive coating on a piece of film, paper, or printing plate. When making prints or copies, it's important to know which side is the emulsion side so that the image can be exposed in the correct orientation (not reversed). Advanced image editors, such as Photoshop, include Emulsion Side Up and Emulsion Side Down options in its Print Preview feature. Enhancement. A term that refers to changes in brightness, color and contrast that are designed to improve the overall look of a digital image. Enlarging easel (masking frame). Flat board with adjustable flaps used on the enlarger base board to hold paper flat during exposure. Equivalent focal length. A digital camera's focal length translated into the corresponding values for a 35mm film camera. For example, a 5.8 - 17.4mm lens on a digital camera might provide the same view as a 38 - 114mm zoom with a film camera. Equivalents are needed because sensor size and lens focal lengths are not standardized for digital cameras, and translating the values provides a basis for comparison. EXIF. Exchangeable Image File Format. Developed to standardize the exchange of image data between hardware devices and software. A variation on JPEG, EXIF is used by most digital cameras and includes information such as the date and time a photo was taken, the camera settings, resolution, amount of compression, and other data. Existing light. In photography, the illumination that is already present in a scene. Existing light can include daylight or the artificial lighting currently being used but is not considered to be electronic flash or additional lamps set up by the photographer. Also sometimes called existing darkness. Exposed. A light-sensitive material that has received exposure to an image. Usually relates to the stage after exposure and before processing. Export. To transfer text or images from a document to another format. Exposure. The amount of light allowed to reach the film or sensor, determined by the intensity of the light, the amount admitted by the iris of the lens determined by the aperture, and the length of time determined by the shutter speed. Exposure compensation. The ability to adjust exposure by one or two stops to lighten or darken the image. Exposure latitude. The amount by which a photographic emulsion may be under- or overexposed, yet still give an acceptable image when processed. Exposure/focus lock. The ability to point at one part of the scene and hold the shutter button halfway down to lock in exposure and focus settings when you point the camera elsewhere to compose the scene. Exposure meter. Instrument that measures light intensities falling on, or reflected off, the subject, and indicates or sets corresponding camera settings (shutter and aperture). Exposure program. An automatic setting in a digital camera that provides the optimum combination of shutter speed and f-stop at a given level of illumination. For example, a sports exposure program would use a faster, action-stopping shutter speed and larger lens opening instead of the smaller, depth of field-enhancing lens opening and slower shutter speed that might be favored by a close-up program at exactly the same light level. Extension tubes. Rings or short tubes mounted between camera body and lens to space the lens further away from the film and so allow the sharp focusing of very close subjects. Exposure values (EV). EV settings are a way of adding or decreasing exposure without the need to reference f-stops or shutter speeds. For example, if you tell your camera to add +1EV, it will provide twice as much exposure by using a larger f-stop, slower shutter speed, or both. Feather. To fade the borders of an image element so that it blends more smoothly with another layer. File format. The way that a digital image is stored. Different formats have different characteristics. Some are cross-platform and can be used on both Macintosh andWindows machines, others have inbuilt compression capabilities. Fill flash. A camera setting that causes the electronic flash to always fire, which produces the effect of filling in shadows in brightly illuminated images. Fill-in. Illumination to lighten shadows, reducing contrast. Fill lighting. In photography, lighting used to illuminate shadows. Film speed. Measure of sensitivity of film to light. Usually expressed as an ISO figure. Filter. In photography, a device that fits over the lens, changing the light in some way. In image editing, a feature that changes the pixels in an image to produce blurring, sharpening, and other special effects. Filter, digital. A filter is a way of applying a set of image characteristics to the whole or part of an image. Most image editing programs contain a range of filters that can be used for creating special effects. FireWire (IEEE 1394). A fast serial interface used by scanners, digital cameras, printers, and other devices. Introduced for the Macintosh and now found on all new Macs, FireWire is now becoming more popular on PCs. Fixed focus. Camera lens set for a fixed subject distance. Non-adjustable. Fixer. Chemical (basically a solution of sodium thiosulfate plus potassium metabisulfite as acidifier). Used after development to make soluble those parts of a photographic image unaffected by the developer. Photographs can thereafter be handled in normal lighting. Fixing agent. Chemical able to change silver halide into colorless soluble salts. Flare. Scattered light that dilutes the image, lowering contrast and seeming to reduce sharpness. Mostly occurs when the subject is backlit. Flash (electronic). Equipment that gives a brief, brilliant flash of light by discharging an electronic capacitor through a small, gas-filled tube. Given time to recharge, a unit gives many thousands of flashes, usually triggered by contacts within the camera shutter. Flash. A technology owned by Adobe and used to create very compressed slide shows and movies for Web display. Flash card reader. An accessory that attaches to your computer by cable. You insert a flash memory card into the reader to transfer files. Flash contacts. Electrical contacts, normally within the mechanism of the camera shutter, which come together at the appropriate moment to trigger the flash unit. Older shutters may be fitted with X and M contact sockets. Use X for electronic flash. Flash factor. See Guide number. Flash, fill. Flash used to fill shadows even when there is enough light to otherwise take the photograph. Flash memory. A form of memory using chips instead of magnetic media. The data in the device isn't lost when the power is turned off. Flash memory card. A card containing chips that store images. Flash, slave. A flash that fires when it senses the light from another flash unit. Flat. An image with low contrast is said to appear flat. 'Flat' images. Images that are low in tonal contrast, appearing gray and muddy. Flatbed scanner. A type of scanner that reads one line of an image at a time, recording it as a series of samples, or pixels. Floodlamp. Studio lighting unit consisting of a large reflector containing a photolamp or other pearl glass lamp. Gives diffuse lighting. Fluorescent illumination. Light produced by a tube coated on the inside with a material that glows. Mercury vapor in the tube emits ultraviolet radiation that is converted to visible radiation by the fluorescent coating. The most important aspect for photographers to consider is that fluorescent illumination doesn't have a true color temperature the way daylight and tungsten illumination does, so special filtration or white balance settings must be used to compensate for color shifts. See also tungsten light. Focal plane. The plane - normally flat and at right angles to the lens axis - on which a sharp image is formed. In the camera, the emulsion surface of the film must be in the focal plane at the moment of exposure to record a focused image. Focal length. In a simple lens the distance (typically in millimeters) between the lens and the position of a sharp image for a subject a great distance away. A 'normal' lens has a focal length approximately equivalent to the diagonal of the picture format it covers, i.e. 50 mm for 36 mm - 24 mm. Focus priority (trap focus). Auto-focus camera mode by which you cannot release the shutter until the lens has sharply focused your subject. Focusing. Changing the lens-to-image (or lens-to-subject) distance, until a sharp image is formed. Focus range. The minimum and maximum distances within which a camera is able to produce a sharp image, such as two inches to infinity. Focus tracking. The ability of the automatic focus feature of a camera to change focus as the distance between the subject and the camera changes. Some cameras use predictive focus to guess where the proper focus point will be, based on the movement direction of the main subject. Fog. Allowing random light to reach light-sensitive material, as in opening the camera back accidentally or leaving a packet of paper open. Also caused by bad storage or contaminated or over-prolonged development (chemical fog). Form. An object's three-dimensionality: height, breadth and depth. Format. Height and width dimensions of the picture area. Front page. Sometimes called the home or index page, refers to the initial screen that the viewer sees when logging onto a website. Often, the name and spelling of this page file is critical if it is to work on the web server. Consult your ISP staff for the precise name to be used with your site. f-stop. The relative size of the lens aperture, which helps determine both exposure and depth of field. The larger the f-stop number, the smaller the aperture. It helps to think of f-stops as denominators of fractions, so that f/2 is larger than f/4, which is larger than f/8, just as 1/2, 1/4, and 1/8 represent eversmaller fractions. In photography, a given f-stop number is multiplied by 1.4 to arrive at the next number that admits exactly half as much light. So, f/1.4 is twice as large as f/2.0 (1.4 x 1.4), which is twice as large as f/2.8 (2 x 1.4), which is twice as large as f/4 (2.8 x 1.4). The f-stops that follow are f/5.6, f/8, f/11, f/16, f/22, f/32, and so on. Most digital cameras have f-stops limited to a range of about f/2.8 to f/8. Focal length. The distance from the optical center of the lens to the image sensor when the lens is focused on infinity. The focal length is usually expressed in millimeters (mm) and determines the angle of view (how much of the scene can be included in the picture) and the size of objects in the image. The longer the focal length, the narrower the angle of view and the more that objects are magnified. Focus. To adjust the lens to produce a sharp image. Focus lock. See Exposure/focus lock. Four-color printing. Another term for process color, in which cyan, magenta, yellow, and black inks are used to reproduce all the colors in the original image. Four Thirds system. The Four Thirds system is a new open standard for digital SLR cameras with interchangeable lenses using a 4/3-inch image sensor. Adopted by a few manufacturers, such as Olympus, the Four Thirds system establishes a common standard for lens design and mounts, improving compatibility between lenses and camera bodies even if they are produced by different manufacturers. Frame grabber. A device that lets you capture individual frames out of a video camera or off a video tape. Framing. In photography, composing your image in the viewfinder. In composition, using elements of an image to form a sort of picture frame around an important subject. Frame Rate. The number of pictures that can be taken in a given period of time. Frequency. The number of lines per inch in a halftone screen. Front-curtain sync. The default kind of electronic flash synchronization technique, originally associated with focal plane shutters, which consists of a traveling set of curtains, including a front curtain (opens to reveal the film or sensor) and a rear curtain (follows at a distance determined by shutter speed to conceal the film or sensor at the conclusion of the exposure). Front-curtain sync causes the flash to fire at the beginning of the exposure - in the instant that the first curtain of the focal plane shutter finishes its movement across the film or sensor plane. With slow shutter speeds, this feature can create a blur effect from the ambient light, showing as patterns that follow a moving subject with the subject shown sharply frozen at the beginning of the blur trail (think of an image of The Flash running backward). See also rear-curtain sync. Front-lighting. Illumination that comes from the direction of the camera. See also backlighting and side-lighting. Full-color image. An image that uses 24-bit color, resulting in 16.8 million possible hues. Images are sometimes captured in a scanner or digital camera with more colors, but the colors are reduced to the best 16.8 million shades for manipulation in image editing. Gamma. A numerical way of representing the contrast of an image. Devices such as monitors typically don't reproduce the tones in an image in straightline fashion (all colors represented in exactly the same way as they appear in the original). Instead, some tones might be favored over others, and gamma provides a method of tonal correction that takes the human eye's perception of neighboring values into account. Gamma values range from 1.0 to about 2.5. The Macintosh has traditionally used a gamma of 1.8, which is relatively flat compared with television. Windows PCs use a 2.2 gamma value, which has more contrast and is more saturated. Gamma correction. A method for changing the brightness, contrast, or color balance of an image by assigning new values to the gray or color tones of an image to more closely represent the original shades. Gamma correction can be either linear or nonlinear. Linear correction applies the same amount of change to all the tones. Nonlinear correction varies the changes tone by tone, or in highlight, midtone, and shadow areas separately to produce a more accurate or improved appearance. Gamut. The range of viewable and printable colors for a particular color model, such as RGB (red/green/blue; used for monitors) or CMYK (cyan/ magenta/yellow/black; used for printing). Gaussian blur. A method of diffusing an image using a bell-shaped curve to calculate the pixels that will be blurred, rather than blurring all pixels, thus producing a more random, less 'processed' look. GIF. Graphics Interchange Format. An image file format limited to 256 different colors that compresses the information by combining similar colors and discarding the rest. Condensing a 16.8-million-color photographic image to only 256 different hues often produces a poor-quality image, but GIF is useful for images that don't have a great many colors, such as charts or graphs. The GIF format also includes transparency options and can include multiple images to produce animations that may be viewed on a Web page or other application. See also JPEG and TIFF. Glossy paper. Photographic paper that can give prints with a shiny, glossy surface. Grayscale. A monochrome digital image containing tones ranging from white through a range of grays to black. Gray card. A piece of cardboard or other material with a standardized 18-percent reflectance. Gray cards can be used as a reference for determining correct exposure or white balance. Grayscale image. An image that is represented using 256 shades of gray. Scanners often capture grayscale images with 1,024 or more tones but reduce them to 256 grays for manipulation by Photoshop. Grain. Irregularly shaped, microscopically small clumps of black silver making up the processed photographic silver halide image. Detectable on enlargement, particularly if the film emulsion was fast (ISO 1000 or over) and overdeveloped. Hard grade paper also emphasizes film grain. Gray market. Importing camera equipment outside of the normal manufacturer's distribution channels to take advantage of lower prices elsewhere in the world. Grade, of paper. Classification of black and white photographic papers by the gradation they offer between black and white. Soft (Grade 1) paper gives a wider range of gray tones than Hard (Grade 3). See also Variable contrast paper. Guide number. A rating of a flash's power. 'Hard' image Image with harsh tonal contrasts - mostly blacks and whites with few intermediate gray tones. 'Hard' light sources. Harsh source of illumination, giving strong clear-cut shadows. Tends to dramatize form and texture. Halftone. A method used to reproduce continuous-tone images, representing the image as a series of dots. High contrast. A wide range of density in a print, negative, or other image. Histogram. A graph that represents the distribution of pixels brightness within a digital image. Highlights. The brightest parts of an image containing detail. Hot shoe. A clip on the top of the camera that attaches a flash unit and provides an electrical link to synchronize the flash with the camera shutter. Hot linked. This term refers to a piece of text, graphic or picture that has been designed to act as a button on a web page. When the viewer clicks the hot-linked item, they are usually transported to another page or part of a website. HTML. The Hyper Text Mark Up language is the code used to create web pages. The characteristics of pages are stored in this language and when a page file is downloaded to your computer the machine lays out and displays the text, image and graphics according to what is stated in the HTML file. Hue. The color of light that is reflected from an opaque object or transmitted through a transparent one. Hue. Refers to the color of the image and is separate from how light or dark it is. Hyperfocal distance. Nearest subject rendered sharp when the lens is focused for infinity. Focused for the hyperfocal distance and without change of f-number, depth of field extends from half this distance to infinity. Hypo. Abbreviation of hyposulfate of soda, an incorrect early name for sodium thiosulfate. Popular name for fixing bath. Hyperfocal distance. When a lens is focused on the hyperfocal distance, the depth of field extends from half that distance to infinity. The point can be calculated or looked up in tables. IEEE 1394. A new port on the computer capable of transferring large amounts of data. Currently the fastest available port.i.Link. Sony's name for IEEE 1394. Image layers. Images in programs like Photoshop Elements can be made up of many layers. Each layer will contain part of the picture. When viewed together, all layers appear to make up a single continuous image. Special effects and filters can be applied to layers individually. Image rotation. A feature found in some digital cameras that senses whether a picture was taken in horizontal or vertical orientation. That information is embedded in the picture file so that the camera and compatible software applications can automatically display the image in the correct orientation. Image sensor. A solid-state device containing a photosite for each pixel in the image. Each photosite records the brightness of the light that strikes it during an exposure. Image stabilization. A technology that compensates for camera shake, usually by adjusting the position of the camera sensor or lens elements in response to movements of the camera. Incident light attachment. Diffusing disc or dome (usually of white plastic) placed over the cell of a hand-held exposure meter to make readings towards the light source. Calculator dial is then used in the normal way. Gives results similar to reading off an 'average' subject or gray card. Infinity. A distance so great that light from a given point reaches the camera as virtually parallel rays. In practice, distances of about 1000 times the focal length or over. Written on lens focusing mounts as 'inf' or a symbol like an '8' on its side. Infinity lock. Control that sets (auto-focus) lens for distant subjects only. Useful if shooting through windows. Inkjet printer. Digital printer, forms images using a very fine jet of one or more inks. Interpolation. This is the process used by image editing programs to increase the resolution of a digital image. Using 'fuzzy logic' the program makes up the extra pixels that are placed between the original ones that were generated at the time of scanning or capture. Inverse square law. When a surface is illuminated by a point source of light the intensity of light at the surface is inversely proportional to the square of its distance from the source. In other words, if you double the lamp distance, light spreads over a larger area and illumination drops to 1/2 - 1/2 = 1/4 of its previous value. Forms the basis of flash guide numbers and closeup exposure increases. Does not apply to large diffuse sources or, in practice, the (extremely distant) sun. Incident light. Light falling on a surface, as opposed to light reflected from a surface. Indexed color image. An image with 256 different colors, as opposed to a grayscale image, which has 256 different shades of the tones between black and white. Infinity. A distance so great that any object at that distance will be reproduced sharply if the lens is focused at the infinity position. International Organization for Standardization. See ISO. Interpolation. In an image interpolation adds extra pixels. It is done with some zoom lenses. Inverse square law. The physical law that causes light from a flash to fall off in such a way that as flash to subject distance doubles, the light falls off by a factor of four. Interchangeable lens. Lens designed to be readily attached to and detached from a camera; a feature found in more sophisticated digital cameras. International Organization for Standardization (ISO). A governing body that provides standards used to represent film speed, or the equivalent sensitivity of a digital camera's sensor. Digital camera sensitivity is expressed in ISO settings. The organization has chosen the word ISO as its standard abbreviation because the name of the group itself varies in the different languages of its members. Interpolation. A technique that digital cameras, scanners, and image editors use to create new pixels based on the values of surrounding pixels whenever an image is resized or changed in resolution. Devices such as scanners and digital cameras also use interpolation to create pixels in addition to those actually captured, thereby increasing the apparent resolution or color information in an image. For example, in a typical digital camera, pixels capture only red, green, or blue information, so the other colors present at that image position are calculated by using interpolation. Invert. In image editing, to change an image into its negative; black becomes white, white becomes black; dark gray becomes light gray; and so forth. Colors are also changed to their complementary color: green becomes magenta, blue turns to yellow, and red is changed to cyan. ISP. The Internet Service Provider is the company that hosts or stores web pages. IrDA. An agreed upon standard that allows data to be transferred between devices using infrared light instead of cables. Iris. A set of thin overlapping leaves in a camera lens that pivots outward to form a circular opening of variable size to control the amount of light that can pass through a lens. See also diaphragm. Jaggies. Staircasing effect of lines that are not perfectly horizontal or vertical, caused by pixels that are too large to represent the line accurately. See also anti-aliasing. Juxtaposition. Juxtaposing is the act of placing two objects side by side so that they are compared. In photographs, unlike subjects are often placed next to each other, or 'juxtaposed', so that their differences are exaggerated. JPEG (Joint Photographic Experts Group). A file format that supports 24-bit color and reduces file sizes by selectively discarding image data. Digital cameras generally use JPEG compression to pack more images onto memory cards. You can select how much compression is used (and therefore how much information is thrown away) by selecting from among the Standard, Fine, Super Fine, or other quality settings offered by your camera. See also GIF and TIFF. K (kelvin). Measurement unit of lighting and color temperature. Large-format cameras. Normally refers to cameras taking negatives larger than 120 rollfilm size. Landscape mode. Holding the camera in its normal orientation to hake a horizontally oriented photograph. Latent image. The invisible image contained by the photographic material after exposure but before development. Stored protected from light, damp and chemical fumes, a latent image can persist for years. Layer. A way of managing elements of an image in stackable overlays that can be manipulated separately, moved to a different stacking order, or made partially or fully transparent. Layer opacity. The opacity or transparency of each image layer in a digital photograph can be changed independently. Depending on the level of opacity, the parts of the layer beneath will become visible. You can change the opacity of each layer by moving the Opacity slider in the Layers palette. LCD Liquid Crystal Display. A display screen type used in preview screens on the back of digital cameras and in most laptop computers. Line (composition). Line is one of the strongest visual elements that photographers can use to help compose their pictures. Often, line is used to direct the attention of the viewer towards a certain part of the frame or at a specific focal point. The lines used in photographs may be actual, such as a power cable in a landscape, or may be created by changes of tone or texture, such as the edge between a shaft of sunlight and the dark background. Liquify. A digital filter that uses brushes to perform distortions upon selections or the whole of an image. Long focal length lens. Lens with focal length longer than considered ‘normal’ for picture format. Gives larger detail and narrower angle of view. Almost all such lenses are telephoto types. Landscape. The orientation of an image in which the longest dimension is horizontal; also called wide orientation. Latitude. The range of camera exposures that produce acceptable images with a particular digital sensor or film. Lens. One or more elements of optical glass or similar material designed to collect and focus rays of light to form a sharp image on the film, paper, sensor, or screen. Lens aperture. The lens opening, or iris, that admits light to the film or sensor. The size of the lens aperture is usually measured in f-stops. See also f-stop, diaphragm, and iris. Lens flare. An optical feature of photography that is both a bane and a creative outlet. It is an effect produced by the reflection of light internally among elements of an optical lens. Bright light sources within or just outside the field of view cause lens flare. Flare can be reduced by the use of coatings on the lens elements or with the use of lens hoods. Photographers sometimes use the effect as a creative technique, and some image editors include a filter that lets you add lens flare at your whim. Lens hood. A device that shades the lens, protecting it from extraneous light outside the actual picture area that can reduce the contrast of the image or allow lens flare. Lens speed. The largest lens opening (smallest f-number) at which a lens can be set. A fast lens transmits more light and has a larger opening than a slow lens. Determined by the maximum aperture of the lens in relation to its focal length; the speed of a lens is relative: a 400mm lens with a maximum aperture of f/3.5 is considered extremely fast, and a 28mm f/3.5 lens is thought to be relatively slow. Lighten. An image editing function that is the equivalent to the photographic darkroom technique of dodging. Tones in a given area of an image are gradually changed to lighter values. See also dodging. Lighting ratio. The proportional relationship between the amount of light falling on the subject from the main light and other lights. Line art. Usually, images that consist only of white pixels and one color; represented in Photoshop as a bitmap. Line screen. The resolution or frequency of a halftone screen, expressed in lines per inch. The term is used within the printing industry. Lithography. Another name for offset printing. Long-focal-length lens (telephoto lens). A lens that provides a narrow angle of view of a scene, including less of a scene than a lens of normal focal length and therefore magnifying objects in the image. Lossless compression. An image-compression scheme, such as TIFF, that preserves all image detail. When the image is decompressed, it is identical to the original version. See also compression. Lossy compression. An image-compression scheme, such as JPEG, that creates smaller files by discarding image information, which can affect image quality. See also compression. Luminance. The brightness or intensity of an image, determined by the amount of gray in a hue. LZW compression. A method of compacting TIFF files in image editors and other applications by using the Lempel-Ziv Welch compression algorithm, which is an optional compression scheme also offered by some digital cameras. Macro lens. Lens intended for close-up photography, able to focus well forward from its infinity position for subjects a few inches away, gives highest quality image at such distances. Macrophotography. Photography at very close subject range. Marquee. A rectangular or elliptical selection used to isolate a portion of a digital photograph made by clicking and dragging to an opposite corner. Mat or overmat. Card with cut-out opening, placed over print to isolate finished picture. >Masking frame. See Enlarging easel. Macro lens. A lens that provides continuous focusing from infinity to extreme close-ups, often to a reproduction ratio of 1:2 (half life-size) or 1:1 (life-size). Macro photography. The process of taking photographs of small objects at magnifications of 1X or more. Macro mode. A lens mode that allows you to get very close to objects so they appear greatly enlarged in the picture. Magnification ratio. A relationship that represents the amount of enlargement provided by the macro setting of the zoom lens, macro lens, or with other close-up devices. Maximum aperture. The largest lens opening or f-stop available with a particular lens or with a zoom lens at a particular magnification. Matrix Metering. An exposure system that breaks the scene up into a grid and evaluates each section to determine the exposure. Megapixel. One million pixels. Used to describe the resolution of digital camera sensors. Mechanical. Camera-ready copy with text and art already in position for photographing to make printing plates. Midtones. Parts of an image with tones of an intermediate value, usually in the 25-75 percent range. Many image editing features allow you to manipulate midtones independently from the highlights and shadows. moire: An objectionable pattern caused by the interference of halftone screens, frequently generated by rescanning an image that has already been halftoned. An image editor can frequently minimize these effects by blurring the patterns. Monochrome. Having a single color, plus white. Grayscale images are monochrome (shades of gray and white only). Monochrome image - single colored. Usually implies a black image, but also applies to one which is toned, i.e. sepia. Montage. An image constructed by combining what were originally several separate images. Mood. The mood of a photograph refers to the emotional content of the picture. Monopod. A one-legged support, or unipod, used to steady the camera. See also tripod. Moore's Law. Gordon Moore's law that predicted that the number of transistors on a chip would double every 18 months. Motion Pictures Expert Group. See MPEG. MPEG. A digital video format developed by the Motion Pictures Expert Group. Multi-megapixel. An image or image sensor with over two million pixels. Multiple exposure mode. A mode that lets you superimpose one image on top of another. Multigrade. Multi-contrast printing paper. See Variable contrast paper. Negative image. Image in which blacks, whites and tones are reversed, relative to the original subject. Color negatives have subject colors represented by their complementaries. Negative. A representation of an image in which the tones are reversed, blacks as white, and vice versa. Neutral color. In image editing's RGB mode, a color in which red, green, and blue are present in equal amounts, producing a gray. NiMH. Nickel metal hydride battery. Ecologically safe and very efficient. Noise. In an image, pixels with randomly distributed color values. Noise in digital photographs tends to be the product of low-light conditions and long exposures, particularly when you have set your camera to a higher ISO rating than normal. Noise reduction. A technology used to cut down on the amount of random information in a digital picture, usually caused by long exposures at increased sensitivity ratings. Noise reduction involves the camera automatically taking a second blank/dark exposure at the same settings that contains only noise, and then using the blank photo's information to cancel out the noise in the original picture. With most cameras, the process is very quick but can double the amount of time required to take the photo. Normal-focal-length lens. A lens that provides about the same angle of view of a scene as the human eye and that does not seem to magnify or diminish the size of objects in the image unduly. NTSC. A US video out standard to display images on a TV screen. Optical resolution. The resolution that a scanner uses to sample the original image. This is often different from the highest resolution quoted for the scanner, as this is scaled up by interpolating the optically scanned file. Options bar. Long bar beneath the menu bar in an image editing program, which immediately displays the various settings for whichever tool is currently selected. Can be moved to other parts of the screen if preferred. Optical zoom. Magnification produced by the elements of a digital camera's lens, as opposed to digital zoom, which merely magnifies the captured pixels to simulate additional magnification. True optical zoom is always to be preferred over the simulated digital variety. See also digital zoom. Open up. To increase the size of the lens aperture. The opposite of stop down. Operating system. The program that controls the camera's or computer's hardware. Orientation sensor. A sensor that knows when you turn the camera to take a vertical shot and rotates the picture so it won't be displayed on it is side when you view it. Overdevelopment. Giving too long or too much agitation in the developer, or having too high a temperature, or developer too concentrated. This results in excessive density and exaggerated grain structure in the developed material. Overexposure. A condition in which too much light reaches the film or sensor, producing a dense negative or a very bright/light print, slide, or digital image. PAL. A European video out standard to display images on a TV screen. Palette. A window in the image editing program that is used for the alteration of the characteristics of a digital photograph. Panchromatic. Photographic materials sensitive to all visible wavelengths of light, recording them in various shades of gray. Should be processed in total darkness or an exceedingly dark safe light. All general-purpose films are of this kind. Panning. Moving the camera so that the image of a moving object remains in the same relative position in the viewfinder as you take a picture. The eventual effect creates a strong sense of movement because the main subject remains relatively sharp while the background blurs. Panorama. A broad view, usually scenic. Some digital cameras also have a panorama mode used with software to stitch the images together. Panoramic mode. A digital camera mode that uses just the center band on the image sensor to capture an image that is much wider than it is tall. Parallax. An effect seen in close-up photography when the viewfinder is offset by some distance from the lens. The scene through the viewfinder is offset from the scene through the lens. Parallax compensation. An adjustment made by the camera or photographer to account for the difference in views between the taking lens and the external optical viewfinder. Parallax error. Viewpoint difference between the picture seen in the viewfinder and as seen by the camera lens. Parallel port. A port on the computer that is faster than a serial port but slower than SCSI, USB, or IEEE 1394 ports. Often used by printers and flash card readers. Pattern (composition). Repeating subjects that have similar characteristics such as color, shape and texture create a strong visual element that is often referred to as pattern. Pattern can be used in a similar way to tone, line and color as a way to balance compositions and direct the viewer's eye throughout the frame. PC card. A card, in the case of cameras usually a storage device, that plugs into a slot in a notebook or hand-held computer. Originally called PCMCIA cards. PCMCIA card. See PC Card. Perspective. The rendition of apparent space in a photograph, such as how far the foreground and background appear to be separated from each other. Perspective is determined by the distance of the camera to the subject. Objects that are close appear large, and distant objects appear to be smaller. Photographic lamps. Generalized term now often applied to both 3200 K studio lamps (floods and spots) and the brighter, short-life 3400 K photoflood lamps. Photo CD. A special type of CD-ROM developed by Eastman Kodak Company that can store high-quality photographic images in a proprietary space-saving format, along with music and other data. Photosite. A small area on the surface of an image sensor that captures the brightness for a single pixel in the image. There is one photosite for every pixel in the image. Picture CD. A CD-ROM designed to hold digital images, often returned by photo finishers with a standard order of prints. The images are stored in a relatively low-resolution JPEG format of sufficient size for use for non-critical applications at home. Pixel. Short for picture element, refers to the smallest image part of a digital photograph. Pixels per inch (ppi). The number of pixels that can be displayed per inch, usually used to refer to pixel resolution from a scanned image or on a monitor. Pixelization. An effect seen when you enlarge a digital image too much and the pixels become obvious. Plug-in. A software module such as a filter that can be accessed from within an image editor to provide special functions. Polarizer. Gray-looking filter, able to darken blue sky at right angles to sunlight, and suppress reflections from (non-metallic) surfaces at angles of about 30°. Polycontrast. See Variable contrast paper. Portrait. The orientation of an image in which the longest dimension is vertical, also called tall orientation. In photography, a formal picture of an individual or sometimes a group. Positive. The opposite of a negative; an image with the same tonal relationships as those in the original scenes - for example, a finished print or a slide. Port. An electrical connection on the computer into which a cable can be plugged so the computer can communicate with another device such as a printer or modem. Portrait mode. Turning the camera to take a vertically oriented photograph. Prepress. The stages of the reproduction process that precede printing, when halftones, color separations, and printing plates are created. Process color. The four color pigments used in color printing: cyan, magenta, yellow, and black (CMYK). Preview screen. A small LCD display screen on the back of the camera used to compose or look at photographs. Prosumer. A very serious photographer who can be either an amateur or professional. 'Pushing'. Slang term for uprating film speed. Rangefinder. A camera design that has a viewfinder separate from the lens. Rapid fixer. Fixing bath using ammonium thiosulfate or thiocyanate instead of the normal sodium thiosulfate. Enables fixing time to be greatly reduced, but is more expensive. RAW. An image file format offered by many digital cameras that includes all the unprocessed information captured by the camera. RAW files are very large and must be processed by a special program, such as Adobe's Camera RAW plug-in or software provided by the camera vendor, after being downloaded from the camera. Read out register. The part of a CCD image sensor that reads the charges built up during an exposure. Rear-curtain sync. An optional kind of electronic flash synchronization technique, originally associated with focal plane shutters, which consists of a traveling set of curtains, including a front curtain (opens to reveal the film or sensor) and a rear curtain (follows at a distance determined by shutter speed to conceal the film or sensor at the conclusion of the exposure). Rear-curtain sync causes the flash to fire at the end of the exposure, an instant before the second or rear curtain of the focal plane shutter begins to move, allowing background light to record when taking flash pictures under dim illumination. With slow shutter speeds, this feature can create a blur effect from the ambient light, showing as patterns that follow a moving subject with subject shown sharply frozen at the end of the blur trail. If you were shooting a photo of The Flash, the superhero would appear sharp, with a ghostly trail behind him. See also front-curtain sync. Reciprocity law failure. Normally the effect of dim light, or small lens aperture, can be counteracted by giving a long exposure time. But this reciprocal relationship (half the brightness = double the exposure time) increasingly breaks down with exposure times beyond 1 second. The film then behaves as if having a lower speed rating. Color films may also show incorrect balance. Recycle time. The time it takes to process and store a captured image. Red-eye. An effect from flash photography that appears to make a person or animal's eyes glow red (or among animals, yellow or green). Caused by light bouncing from the retina of the eye, red-eye is most pronounced in dim illumination (when the irises are wide open) and when the electronic flash is close to the lens and therefore prone to reflect directly back. Image editors can fix red-eye through cloning other pixels over the offending red or orange ones. Red-eye reduction. A way of reducing or eliminating the red-eye phenomenon. Some cameras offer a red-eye reduction mode that uses a preflash that causes the irises of the subjects' eyes to contract just before a second, stronger flash is used to take the picture. Reflection copy. Original artwork that is viewed by light reflected from its surface rather than transmitted through it. Reflector. Any device used to reflect light onto a subject to improve balance of exposure (contrast). Another way is to use fill flash. See also fill flash. Reflex camera. Camera with viewfinder system using a mirror and focusing screen. Refraction. Change of direction of a ray of light passing obliquely from one transparent medium into another of different density, e.g. from air into glass. The basic reason why lenses bend light rays and so form images. Refresh rate. The time it takes the camera to capture the image after you press the shutter release. Register. To align images, usually for lining up color separations for making printing plates. See also registration mark. Registration mark. A mark that appears on a printed image, generally for color separations, to help in aligning the printing plates. Many applications, such as Photoshop, can add registration marks to your images when they are printed. Removable media. Storage media that can be removed from the camera. Reproduction ratio. Used in macro photography to indicate the magnification of a subject. Resample. To change the size or resolution of an image. Resampling down discards pixel information in an image; resampling up adds pixel information through interpolation. See also interpolation. Resin-coated (RC). Bromide paper Bromide paper having a water-repellent plastic base. RC papers require less washing, dry more rapidly and generally process faster than fibre-based papers. Resolution. In image editing, the number of pixels per inch. Resolution is used to determine the size of the image when printed. That is, an 8 x 10-inch image that is saved with 300 pixels per inch (ppi) resolution will print in an 8 x 10-inch size on a 300 dpi printer or 4 x 5 inches on a 600 dpi printer. In digital photography, resolution is the number of pixels that a camera or scanner can capture. Resolution, interpolated. A process that enlarges an image by adding extra pixels without actually capturing light from those pixels in the initial exposure. Resolution, optical. The true resolution of an image based on the number of photosites on the surface of the image sensor. Retouch. To edit an image, most often to remove flaws or to create a new effect. Reversal film. Film that can be processed to give a positive image, such as a color slide film. Some black and white films can be reversal processed. RGB. The color system used in most digital cameras where red, green, and blue light is captured separately and then combined to create a full color image. RGB color mode. A color mode that represents the three colors (red, green, and blue) used by devices such as scanners and monitors to reproduce color. Photoshop works in RGB mode by default and even displays CMYK images by converting them to RGB. See also CMY(K) color model. Rollfilm. Photographic film, usually 6.2 cm wide (known as 120), attached to a numbered backing paper and rolled on a flanged spool. Safe light. Darkroom light source filtered to illuminate only in a color to which photographic material is insensitive. The correct color varies with type of emulsion, e.g. orange for bromide papers. Saturation. The purity of color; the amount by which a pure color is diluted with white or gray. Scale. To change the size of some or all of an image. Rescaling also affects file size. Scanner. A device that captures an image of a piece of artwork, a slide, or a negative and converts it to a digitized image or bitmap that the computer can handle. SCSI port. A port that's faster than the serial and parallel ports but slower and harder to configure than the newer USB port. Also know as the Small Computer System Interface. Secure Data memory card. A flash memory card format that is gaining acceptance for use in digital cameras and other applications. Selection. In image editing, an area of an image chosen for manipulation, usually surrounded by a moving series of dots called a selection border. Selective focus. Choosing a lens opening that produces a shallow depth of field. Usually, this is used to isolate a subject by causing most other elements in the scene to be blurred. Self-timer. Mechanism that delays the opening of the shutter for some seconds after the release has been operated. Sensitivity. A measure of the degree of response of a film or sensor to light, measured in digital cameras using ISO ratings. Sensor array. The grid-like arrangement of the red-, green-, and blue-sensitive elements of a digital camera's solid-state capture device. One vendor offers a sensor array that captures a fourth color, termed emerald. Serial port. A very slow port on the computer used mainly by modems. Many digital cameras come equipped with cable to download images through this port but it's slow! Both parallel and USB ports are faster connections. Shading, in printing. Preventing the image light from acting on a selected area of the picture for a time during the exposure. See Dodging. Shadow. The darkest part of an image, represented on a digital image by pixels with low numeric values or on a halftone by the smallest or absence of dots. Sharpening. Increasing the apparent sharpness of an image by boosting the contrast between adjacent pixels that form an edge. Sheet film. Film supplied as individual sheets, usually 10 or 25 to a box. Short-focal-length lens (wide angle). A lens that provides a wide angle of view of a scene, including more of the subject area than does a lens of normal focal length. Shutter. In a conventional film camera, the mechanism consisting of blades, a curtain, plate, or some other movable cover that controls the time during which light reaches the film/sensor and exposes the image. Digital cameras can use actual shutters or simulate the action of a shutter electronically. Quite a few use a combination, employing a mechanical shutter for slow speeds and an electronic version for higher speeds. Many cameras include a reassuring shutter sound that mimics the noise a mechanical camera's shutter makes. Shutter-priority mode. An automatic exposure system in with you set the shutter speed and the camera selects the aperture (f-stop) for correct exposure. Shutter Speed. The length of time the shutter is open and light strikes the image sensor. Side-lighting. Light striking the subject from the side relative to the position of the camera; produces shadows and highlights to create modeling on the subject. Silver halides. Light-sensitive compounds of silver with the halogens (iodine, bromide, etc.). Normally white or creamy yellow in color. Used as the main sensitive constituent of photographic emulsions. Single autofocus. The camera lens focused only when the shutter release button is partially depressed, just prior to taking the picture. See also continuous autofocus. Slave unit. An accessory flash unit that supplements the main flash, usually triggered electronically when the slave senses the light output by the main unit. Slide. A photographic transparency mounted for projection. Slow-sync. An electronic flash technique for using the flash at a slow shutter speed, which allows background details to show more clearly. SmartMedia. A type of memory card storage, generally outmoded today because its capacity is limited to 128MB, for digital cameras and other computer devices. Smoothing. To blur the boundaries between edges of an image, often to reduce a rough or jagged appearance. Soft focus. A diffused, unsharp image effect produced by the use of a special lens that creates soft outlines. Soft lighting. Lighting that is low or moderate in contrast, such as on an overcast day. 'Soft' light sources. See Diffuse lighting. Specular highlight. Bright spots in an image caused by reflection of light sources. Sponge tool. Used for saturating or desaturating part of a digital photograph, that is exaggerating or lessening the color component as opposed to the lightness or darkness. Spot color. Ink used in a print job in addition to black or process colors. Spotlight. A compact filament lamp, reflector and lens forming one light unit. Gives hard direct illumination, variable from narrow to broad beam. Spot metering. An exposure calculation system that emphasizes a small portion of the image area, usually in the center of the frame. Some cameras let you move the 'spot' to other portions of the image area. Stop. 1. An aperture setting that indicates the size of the lens opening. 2. A change in exposure by a factor of two. Changing the aperture from one setting to the next doubles or halves the amount of light reaching the image sensor. Changing the shutter speed from one setting to the next does the same thing. Either changes the exposure one stop. Stop-bath. Stage in processing that arrests the action of the previous solution (e.g. a weak solution of acetic acid used between development and fixation). Stop down. To decrease the size of the lens aperture. The opposite of open up. Storage media. In the digital camera world, storage media most often refers to the flash memory cards used to retain images before they are transferred to your computer or another device. There are nearly a dozen different types media used by digital cameras, and the number seems to grow monthly. The most common types include two sizes of CompactFlash cards (the main difference is in the thickness); microdrives (tiny hard disks), Sony Memory Sticks, Sony Memory Stick Duo, Secure Digital (SD) cards, SmartMedia Card (generally an obsolete format today), xD Picture Card, and Reduced Size MultiMedia Card. Subtractive primary colors. Cyan, magenta, and yellow, which are the printing inks that, when mixed together equally, theoretically absorb all color and produce black. In practice, however, they generate a muddy brown, so black ink is added to preserve detail (especially in shadows). The combination of the three colors and black is CMYK. (K represents black, to differentiate it from blue in the RGB model, and is sometimes placed in parentheses to indicate that it's an optional part of the color model.) See also CMY(K) color model. 'T' setting. Setting found on some large-format camera shutters for time exposures. Pressing the release opens the shutter, which then remains open until pressed for a second time. Tagged. Image File Format: See TIFF. Target audience. The group of people whose experience, understanding and appreciation are catered for when creating a picture, or taking a photograph. The content or style of picture may change depending on the nature of the target audience who will be viewing the work. Telephoto lens. A lens or lens setting that magnifies an image. Test strip. One of a series of test exposures on a piece of printing paper, then processed to see which gives the most satisfactory result. Texture. Surface qualities such as roughness, smoothness, hairiness, etc. Like line, pattern and color, texture is a compositional element that can be used to help balance a photograph. Thermal wax transfer. A printing technology in which dots of wax from a ribbon are applied to paper when heated by thousands of tiny elements in a printhead. Threshold. A predefined brightness level used by a device to determine whether a pixel will be represented as black or white. thumbnail: A miniature copy of a page or image that provides a preview of the original. Through-the-lens (TTL) metering. Measuring exposure by a meter built into the camera body, which measures the intensity of light passing through the picture-taking lens. Thumbnail. A low-resolution preview version of larger digital image files used to check before opening the full version. TIFF (Tagged Image File Format). A standard graphics file format that can be used to store grayscale and color images plus selection masks. Time exposure. A picture taken by leaving the lens open for a long period, usually more than one second. The camera is generally locked down with a tripod to prevent blur during the long exposure. Time-lapse photography. Taking a series of pictures at preset intervals to show such things as flower blossoms opening. Tint. A color with white added to it. In graphic arts, tint often refers to the percentage of one color added to another. Tolerance. The range of color or tonal values that will be selected, with a tool like an image editor's Magic Wand, or filled with paint when using a tool like the Paint Bucket. Tone (subject matter). Tone can also refer to the mood of a picture. When the tone of a photograph is said to be 'dark', then the subject matter and/or the way that the content is depicted can be emotional, complex, sometimes sad, confronting and generally thoughtprovoking. Tones, tonal values. Areas of uniform density in a positive or negative image that can be distinguished from darker or lighter parts. Translucent. Transmitting but at the same time also diffusing light, e.g. tracing paper. Transparency. A positive photographic image on film, viewed or projected by light shining through the film. Transparency scanner. A type of scanner that captures color slides and/or negatives. Tripod. A three-legged supporting stand used to hold the camera steady. Especially useful when using slow shutter speeds and/or telephoto lenses. .
TTL: Through the lens . A system of providing viewing through the actual lens that takes the picture (as with a camera with an electronic viewfinder, LCD display, or single-lens reflex viewing), or calculation of exposure or focus based on the view through the lens. Tungsten lamps. Lamps that generate light when electric current is passed through a fine tungsten wire. Household lamps, photofloods, studio lamps, etc. are all of this type. Tungsten light. Light from ordinary room lamps and ceiling fixtures, as opposed to fluorescent illumination. Tungsten light film. Also known as 'Type B' or 'Artificial light'. Color film balanced for use with 3200 K studio lighting. Tv: Time value. AE camera metering mode by which you choose shutter speed and the metering system sets aperture (also called shutter priority). Twin lens reflex. Camera with two linked lenses - one forming an image onto film, the other giving an image on a focusing screen. Unbundling. When a dealer removes normally included items from a camera package and then sells them to you separately. Under-development. Giving too short a developing time, using too low a temperature, too great a dilution or old or exhausted solutions. This results in insufficient density being built up. Underexposure Exposing photographic material to too little light, because the image is too dim or exposure time too short. Results in insufficient density and shadow detail in the final image. Underexposure. A condition in which too little light reaches the film or sensor, producing a thin negative (one with little density), a dark slide, a muddy-looking print, or a dark digital image. Unipod. A one-legged support, or monopod, used to steady the camera. See also tripod. Unsharp masking. The process for increasing the contrast between adjacent pixels in an image, thus increasing sharpness, especially around edges. Upload. Sending a file from your computer to another device. Uprating. Shooting film at more than the manufacturer's suggested speed rating, e.g. exposing 400 ISO film as if 800 ISO. The film is then given extra development. URL (Uniform Resource Locator). The address of a Web site. USB (Universal Serial Bus). A high-speed serial communication method commonly used to connect digital cameras and other devices to a computer. USB port. A high-speed port that lets you daisy-chain devices (connect one device to another). Variable contrast (multigrade) paper. Black and white printing paper that changes its contrast characteristics with the color of the exposing light. Controlled by enlarger filters typically ranging from yellow to purple. VGA. A resolution of 640 x 480. Viewfinder. The device in a camera used to frame the image. With an SLR camera, the viewfinder is also used to focus the image if focusing manually. You can also focus an image with the LCD display of a digital camera, which is a type of viewfinder. Viewpoint. The position from which camera, and photographer, view the subject. Vignetting. Adding dark corners to an image; often produced by using a lens hood that is too small for the field of view, or generated artificially by using image editing techniques. Video card. A card the fits into a computer's expansion slot so you can edit digital video. Wetting agent Chemical. (e.g. weak detergent) that reduces the surface tension of water. Facilitates even action of developer or final wash water. White. The color formed by combining all the colors of light (in the additive color model) or by removing all colors (in the subtractive model). See also additive primary colors and subtractive primary colors. White balance. The adjustment of a digital camera to the color temperature of the light source. Interior illumination is relatively red; outdoor light is relatively blue. Digital cameras often set correct white balance automatically or let you do it through menus. Image editors can often do some color correction of images that were exposed using the wrong white-balance setting. White point. In image editing, the lightest pixel in the highlight area of an image. Wide-angle lens. Lens with a focal length much shorter than the diagonal of the format for which it is designed to be used. Gives a wide angle of view and considerable depth of field. Zoom. In image editing, to enlarge or reduce the size of an image on your monitor. In photography, to enlarge or reduce the size of an image using the magnification settings of a lens. Zoom lens. A lens that offers continuous variation of focal length over a set range, maintaining the same focus setting.